ESS offers several free exercise and falls prevention classes for seniors throughout the community. Classes are provided at different levels to suit your fitness needs and abilities. They are led by certified senior fitness instructors or Registered Kinesiologists who understand the importance of staying active and preventing injury and falls. 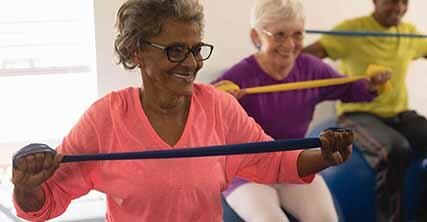 Our exercise programs are developed to encourage older adults and seniors aged 55+ to become more active, participate in a social network, reduce the risk of injuries and falls, as well as enhance self-esteem and independence. All classes include a light cardio component and are designed to increase balance, strength and flexibility. Group classes led by certified seniors’ fitness instructors or Registered Kinesiologists. These classes combine light cardio, strength and balance exercises to improve general mobility, endurance and balance. For adults 55+. Gentle group exercise classes led by Registered Kinesiologists for individuals who use mobility aids, have had a fall in the last 3 months, are new to a group exercise class and/or want an overall body workout at a beginner’s pace. For adults 55+. All classes are free, there is no cost to attend. Classes are offered at multiple locations year-round. Click here to view the class schedule. Please note this schedule is subject to change.